"Exactly what I needed for my small business"
Signority is easy to use for both my business and my clients. Using Signority, I can send contracts and information forms via email that can be completed conveniently and securely on the web. Hassle free! It has all the features I need, and doesn't have a million features I'll never use. Signority support is fast and responsive, and they really take user feedback into account when making updates. Occasionally the system will go down with no notice from Signority and I will not be able to login or the site will log me out, or will not load at all. But I expect this with a smaller company that is still working on infrastructure, etc. Give the free trial a spin! Start by uploading documents you send frequently as templates, once you have the templates in place it is so easy to create contracts to send. It is so easy to send contracts and information forms for customers and contractors to complete. I was sending hundreds of PDF forms each month via email, many of which were printed out, then scanned back to me. Now we are saving paper and staying organized. "Signority saves me hours of manual work"
Other than the fact that I am saving countless hours of what would be manual work (Printing + Signing + Scanning) I like their support. Kevin from support gets back to me very quickly whenever I have a query. I am also making significant savings on my printing costs! There isn't much that I dislike about Signority, the user interface takes a while to get used to. If it wasn't for the support team setting me up with a demo, I would probably be stuck for hours trying to figure out how to use it. 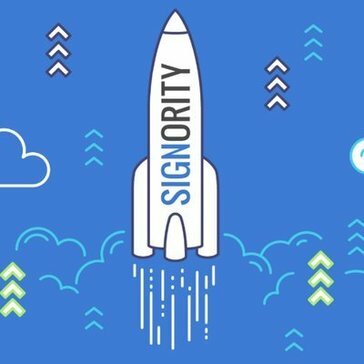 The feature that sets signority apart from other SAAS based signature services is their unique support. They will personally help you out with any problem that you may have. Signority helps me streamline my business process by automating the signing step which in turn saves me hundreds of hours of manual work. Some of the benefits that I have realized from using this product is the fact that not only I am saving money on printing supplies I am also saving on time as well which is in turn equivalent to money. "Signority is a win-win for our office as well as our clients!" It's extremely simple to use on both sides of the process. It adds a "wow" factor when our clients find out that we have this option and how easy it is to use. The only issue I've come across is the emails to clients sometimes go to their spam folders or get rejected, but otherwise no complaints! I highly recommend Signority. When we first signed up with them we sent in a few suggestions that would make our business run smoother and within a few months the suggestions had been taken and included in their latest update! You don't come across this often in an organization. Signority is definitely worth checking out! Far more efficient in writing new business and it saves time and is less of a hassle for our clients! The dashboard is laid out in such a way that actually makes sense to the end user. Too many of the programs I have used in the past do not have their correctly laid out or done in a way that it is user-friendly. The signing of the document could use a little work. I've had clients try and sign from the their tablet or mobile devices and expressed that it wasn't as easy to use as they had hoped. Give it a try. The support is great, so if you run into a 'hiccup' just let them know. They've been very helpful. It saves me time being able to use the template feature. Not having to constantly recreate something is wildly helpful. "Great Product and Easy to Get Started"
I signed-up because I don't have a printer or scanner in my hotel room and it saves me the time and money of having to go to the UPS Store or Fedex Office (or some other place like them). I travel a lot for work so if I need to sign and send documents and use your site I don't have to worry about bringing a large all-in-one device everywhere I go or finding a place to get it done. Even nice hotels that have an office center charge you a good bit. For a few pages - printing and scanning - it can be 5-10 dollars plus the hassle. I used the website this morning and all looks well. Pretty easy to pickup and get going with it. Great job! Easy to get started using the product. "Very happy with Signority and their templates"
I like that it is very easy to use a template to send contracts to clients for my home inspection business. The reminder emails to clients are nice as well. Kevin has been great listening to my suggestions and is working on integration with Zapier to allow for more automation. I can't think of anything I dislike. Once the integration with Zapier is up and running, I imagine all my wishes will come true! Signority is always updating. Reach out to their customer service with things you would like to see and they may just implement them! Having clients sign the contracts online so they don't have to come to the home inspection. "E signatures has its pros and cons "
The quality of the document that I get back from the client. Its clear and easy to read. No blurry fax or poorly scanned copies. The number of steps involved for me to set up the document and send it to the client. The sign in process is problematic. It is constantly trying to connect to my facebook page. Even through I've told it no. The only way I found around this was to use a different browser with a pop up and ad blocker. Definitely do the trial and figure out of its right for you. Be prepared for a little more work on your end. reducing paper use and making it easier for clients to sign documents on the go. Overall its an easier process for the end client but its more steps for me. "My experience with Signority has been okay but efficient." I like how quickly I can send out documents for signatures, it overall improves the turnaround rate. It is really simple which is nice for a service like this. When comparing other services, they were often overly complicated and it was unnecessary - I just need my documents signed. We use Signority for onboarding new clients and having them sign the contract for our scope of work. We can not being working until the contract is signed and sometimes that process just gets held up, Signority has helped in improving that process and allowing us to start faster. "Good Product, bad customer service"
The ability to have the customer fill in the forms online and have them emailed cut down on paper and a more user friendly experience. The turn over of staff and the new staff members not learning about the client they are serving is unacceptable. They don't respond to emails, hard to reach by telephone. They make the effort to get the deal made but once you are a client you are not taken care of. "Great product for streamlining document signing and management proccess"
The customer service is top notch. They listen to our needs and have been extremely proactive about adding the functionality needed to meet our specific requirements. There is no way that we would get this level of service from the larger vendors. There are views and functionality that can be simplified, made more intuitive, added or tweaked to suit our specific needs. However, I have tested various e-signature vendor platforms and Signority has been my favorite platform. Based on my experiences with this company so far, I am confident the software will continue to get better. "Saves me hours of work! " Keep up with the great work, looking forward to seeing improvements! Contract signing -- no more paper! Really saving time which is money on our end. The faster we can get contracts signed and limit back and forth the better. As well we have integrated it into our new contractor and employee onboarding process which has really saved us a ton of time when bringing on new team members which has been really cool. Signority has built a platform that keeps getting better and better. They listen to and address the needs of their users and have wonderful support. Earlier versions of the Signority platform were less intuitive for users and it took a bit of time before they got the formula right. We use Signority primarily to send out our legal service agreements for electronic signatures by our clients. The program helps us speed up our matter intake process which is particularly useful when a prospective client has an urgent issue. "Easy to work with, good tech support"
Very helpful in getting the product set up when we initially set up a trial. Easy to adapt and change our templates, and they even helped me figure out how to integrate with our crm system. It's a little bit easy to change the templates when you think you are changing the document. I had to educate our team to make sure we weren't changing the template. Make sure that you train your staff to make sure that they are not adding a specific recipient to the template, and are instead adding it to the specific document going out. Biggest problem is making it easy for people to sign our paperwork, and keeping their data secure, particularly around credit card information. I like how easy it is to navigate the service of online document signing. The staff are friendly and easy to work with. I don't like that there isn't a way for clients to sign by voice. A voice authentication or voice signature feature would be awesome. We have realized that this service saves us a lot of time by getting signatures sign over the phone electronically through a link vs faxing, mailing, or scheduling face to face appointments to capture signatures. ""We have gotten a lot more out of this product than expected""
I love how I am able to save time and paperwork by using this software. I also like how I am able to speak with a real person any time I have any questions. The customer service manager, Kevin is very friendly and the sales manager contacted me herself to make sure there was nothing I needed help with! I have had a great experience! We have also saved ALOT of money on postage which has offset the cost of the actual software. There is nothing I have found that I dislike. Easy to use and the service is top notch. We have started using this product for a few things. We require signatures when damaging out our goods, EAS (our security system), our deposits from the safe among a few others. We have tried to make our signing processes as seamless as possible while getting rid of as much physical paper as possible. Everything is stored in the cloud and can still be accessed whenever we need them! Needed signed permission forms for the kids in the band, but time was short and needed quick turn around. Otherwise, no amusement park for the kids. I had a Word doc version of the form. I heard of Signority, looked them up, and I actually called them. Kevin help me kick-start the distribution. I took no time at all. Easy to chase down who didn't sign. I don't use paper permission forms anymore. Signority is way more convenient. Happy with the service. Sometimes parents don't quite get the technology. Try it out. Then, you will see the time it saves. Save paper, save chasing parents, save pestering band kids. "Perfect way to do business online"
I love how easy it is to get paperwork signed and finalized! Not much to dislike here. Signority makes it easy to work with my clients! If you need documents signed, Signority can help with that! Getting an agreement on paper and signed is key to a happy customer and good business. Signority has helped me achieve that without all the hassle of mailing documents or risking proceeding without paperwork. Very easy to navigate. The drag & drop features are wonderful and great for clients who aren't tech savvy. It's not the most well-designed, but I don't mind the lack of design for a service of this sort. My business uses the service primarily for new project contracts and licensing agreements. It's very quick and easy and thus we get our documents signed and projects move forward faster. "Term sheets signed and money in the bank"
Having invested in a number of companies, the signature of term sheets is a pain. Print. Sign. Scan. Send. I believe signority has solved significant issues in the process as well as the collection of signatures. Which accelerates the process of money in the bank for a startup. Actually I got used to it and not all law firms use it. They should. Great product for a great price and is very user friendly which is essential. I haven't had any issues with it and have been using it for several months. I have to have clients sign documents quickly and this is a great tool. Plus I am able to track the process and have the time stamp on the docs so this solves compliance issues. "Love the simplicity and how organized I am with Signority"
At certain times throughout the year, I work with several contracts for marketing buys and event orders/logistics. Signority has made it very simple to complete, sign and deliver all required forms - especially when I'm not in the office. It's quick and I have a "paper" trail. I find I'm much more organized. Can't think of anything at the moment. I mostly use it to sign documents and send back to vendor. Having a quick and organized way to sign and deliver documents. I like having everything online - it's very quick to send updates to people for audit purposes etc. "Major time saver and so easy to use!" I love that you can create templates and reuse the same document over and over again. That has been key in helping speed up work processes, as we simply save the templates and reuse with different clients. Moreover, even if you don't save the completed documents, you know that you can go back to this one single location to refer back to them, should you be off-site or not have access to your files. It was a bit confusing to set up initially, but once one of the awesome members in the Signority team helped me out, it was very easy and intuitive to use. Onboarding of clients used to be time consuming and required printing, signing, scanning, saving, etc... Now, it is quick and easy and requires nothing but sending a link to clients. I like that the price is only influenced by the number of uses. Hence, I don't have a useless recurring fee. Occasional server issues; nevertheless, they're promptly corrected. I use Signority for any electronic contracts that I need to send to clients and business partners. "Signority is an Awesome Product." Signority is a great product. It has made our business much easier by allowing us to securely send contracts and agreements for signature via email. Can't think of anything to report at this time. I would highly recommend this software. You won't be disappointed. Instead of going around the office and getting signatures then sending them by courier to the next person to sign, we can just do it all through Signority. It allows you to number the people who sign 1st, 2nd etc. Enough controls in place ensuring safe use - especially being cloud based. Though recently changed, had trouble managing templates and status of their updates/changes. Canadian company if that matters to some. Have not implemented company wide yet but attempting to resolve 'chasing' people for signatures. Easy and intuitive user experience. I like the newly implemented design of the product. It works well on mobile as well. The process of verifying a witness seems an it tedious but I guess it needs to be that way to be compliant. We have used signority for our employment agreements and NDAs. The solution is very convenient for us since some of our contractors don't work in the same city as our company so they cannot sign documents in person. The easy-to-use interface, both for internal and external audiences. The loading time time isn't always that great. I work remotely, often without ever interfacing with clients face-to-face. Signority allows me to get legal documents fully executed online, quickly and easily. "Eliminate paper from day to day activities "
Signority has helped me eliminate many of the paper based process that I use on a regular basis. Documents such as NDAs, contracts, and statements of work can be delivered electronically making it easier for clients to execute, resulting in much faster turn around time. Occasionally emails to clients will end up in their spam folder. I am eliminating paper from the contracting process. No more chasing paper, lost documents, and delays. The automated reminders are great as I no longer have to chase after people, plus I can track it all via my dashboard. Lack of integration with Dropbox, though I hear it's coming in the next release soon, and this fast turn around is why I like gen a lot. "Easy to get contracts signed." I operate and run my interior business part-time and Signority has been very useful for getting contracts signed. Interface can be a bit confusing for a first-time user. Tracking information shows all in one place. The trial runs out before you get to test unless you have a lot of volume. Signing real estate documents. Faster turn around time and ease of signing for customer/client. Making it easier to get back an answer on signature! Usability could use quite a bit of work. No font matching which also is not ideal for writing out specific elements within the contract. Yes - good price point. Staff has been extremely friendly which is important especially when trying to setup your first template upon first design. Quick signback from clients.. going paperless. Very easy to use, and its security looks so stable. I'm using every month. Until for now, I don't find any of dislike thing, when I feel some let me tell you at the moment. I have 3 new clients a month in average. Those clients are from everywhere, so I could use this Signority to make a contract. Great customer service, very easy to set up templates. Great for a small business. As a small consulting firm, Signority takes the pain of sending, tracking, storing contracts. Once I set up the template, it was super easy from that point on. "Brilliant Product! It is saving me lots of time." The interface is user friendly, making it very easy to use and intuitive. There is always a room for improvement. I believe the interface can become even easier and more intuitive. It is very easy to use and reliable. My clients can sign the contracts, and sign off mock ups in timely and safe manner. Easy implementation into our regular business, with excellent troubleshooting support. I'm a fan - I've tried DocuSign, but prefer Signority. I'll let you know as soon as I find out. But then they'll make it better, so how can you dislike that! customer support is the best. their support is really fast and efficient. by using this companies service i can save my money, time and my employees are very satisfied. Signority makes it fast and easy to sign legal documents online. The personal account does not include all the available features. There are a number of alternatives in the online document signing space. The team at Signority is great, and they will do their best so help you understand the product and get up to speed. Signority has allowed be to sign business contracts online in a secure and transparent manner. It has helped me land clients and manage the relationships. "Signority has been a huge help saving time and paper"
I really like the ease of use of Signority, and being able to save time and paper when signing documents. Not much I can think of... The user interface has quire some options that I don't all use which was a bit confusing at first, but it was easy enough finding my way after using the software a few times. Signing documents usually takes a lot of time, especially when signatories are away- Signority has helped cutting down that time. "Easy to use and great for our vendors"
"Limited review, works well, but not needed at this time. Perhaps in the near future." Convenience with obtaining signatures quickly in today's busy environment. Cost is high, considering we have certain e-signature capabilities already. We have the capability to obtain signatures through most of our insurance company software already. Easy to upload a pdf document and identify the sections to sign. Cannot password protect the signed document. Tax documents that need to be signed. "Signority has made the approval process simple and efficient"
* We monitor all Signority reviews to prevent fraudulent reviews and keep review quality high. We do not post reviews by company employees or direct competitors. Validated reviews require the user to submit a screenshot of the product containing their user ID, in order to verify a user is an actual user of the product.